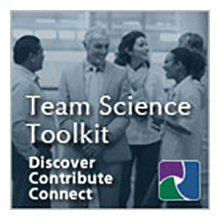 Preconference Workshop "Fundamentals of Team Science and the Science of Team Science"
The Science of Team Science (SciTS) 2015 Conference will be held June 3-5, 2015 at the National Institutes of Health main campus in Bethesda, Maryland. The Science of Team Science (SciTS) is a rapidly growing cross-disciplinary field of study that aims to build an evidence-base and to develop translational applications to help maximize the efficiency and effectiveness of team based research. The 2006 National Institutes of Health SciTS Conference helped to launch the SciTS field. Nearly 10 years later, the 2015 SciTS 2015 Conference will review the current state of knowledge in the SciTS field, highlight applications for enhancing team science, and discuss future directions for advancing SciTS to improve the global scientific enterprise. The SciTS 2015 Conference (http://www.scienceofteamscience.org) will bring together thought leaders in the SciTS field, scientists engaged in team-based research, institutional leaders who promote collaborative research, policy makers, and federal agency representatives. With this year’s location in the Washington DC metro area, a range of federal agencies will be participating, creating a unique focus on effective practices and policies, translational applications of SciTS scholarship, and approaches to evaluation. This year’s conference will also highlight the interface of the SciTS field with current hot topics and emerging trends, including diversity in science teams, big data, citizen science, open data, and research networking. The conference program will include invited speakers and plenary sessions in addition to submitted panels, papers and posters. Register here for the free conference!